Polished granite headstones are among the strongest stones available for grave markers, but they still require a delicate touch when cleaning. Harsh cleaners soak into the porous stone and cause stains. Metallic brushes will scratch the surface. Before cleaning the headstone, evaluate what kind of dirt you want to remove. Always try the least aggressive approach before moving on to stronger, and possibly damaging, cleaning methods. If you do not own the stone, check with the cemetery before attempting to clean any headstone. 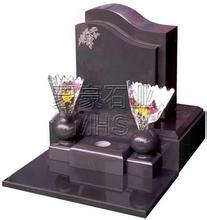 Firstly, check the polished granite headstone for any cracks, flaking or erosion. Tap it gently to determine if the stone has any hollow areas. Do not clean or handle a stone with underlying hollow areas or extensive damage as this may make the problem worse. Consult a stone specialist if the stone is damaged. Secondly, determine what has soiled the stone. Common problems include: dirt and grime; organic material such as algae or fungus; metallic or oil stains; and salt. Thirdly, rinse the stone gently with water. If water alone does not work, use a non-ionic, neutral pH detergent, such as Kodak's Photo-Flo. This chemical, used in photo development, will clean without changing the chemical balance of the stone. Mix one capful per gallon of water, and put the solution in a spray bottle. Test the cleaner on an inconspicuous part of the stone first. Fourthly, saturate the culture stone with water before applying any cleaner to prevent the stone from absorbing the cleaning solution. Work from the bottom up to prevent streaking, and continue rinsing the stone as you work. Rinse it again when you are finished cleaning. Do not let cleaning solutions dry on the tomb stones. Be patient with the cleaning solution. It is not as strong as other cleaners and therefore may take longer to work.